Rub up against Deadpool every time you go for a drive! He'll definitely appreciate it. 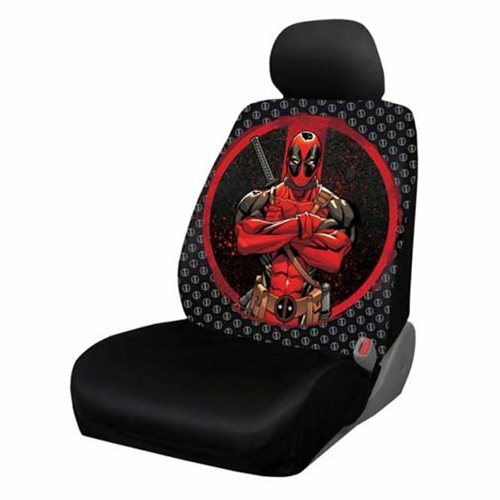 This Deadpool Repeater Low Back Seat Cover features the hilarious character standing with arms crossed in front of a large Deadpool logo in front of a bunch of smaller Deadpool logos. Made from 100% polyester with a urethane foam backing, it's designed to fit most low-backed (removable headrest) bucket seats and comes with a headrest cover, plus elastic straps and hooks for a snug and secure fit. Machine washable. Measures 24-inches tall x 23-inches wide. Ages 13 and up. Note: Contains one single seat cover.